As an expat Brit living in the US, I am routinely exposed to American stereotypes of Britishness, most of which appear to be informed by 1990s BBC and ITV low budget period dramas. Not that I mind, of course; generally we Brits tend to come off as quaint or charming rather than backwards-thinking or aloof, which are perhaps the other obvious assumptions to be drawn from such productions. Also, we live a very long way away; nothing we do there really affects how anything goes here and we also have a royal family, which is silly but fun. In short, we’re generally considered a rather nonthreatening bunch and are all the better for it. But what about closer to home? The results of the recent UK general election have left many reeling, myself included, at the seemingly incomprehensible right-wing lurch the British electorate seems to be taking (Scotland and most of Wales notably excluded). Following his reelection as PM, good old (read: bad) Mr Cameron now has to make good on his promise of delivering an in/out referendum on Britain’s membership of the EU. If the British (read: English) electorate’s recent performance is anything to go by, we could therefore soon be waving bye-bye, or rather shouting ‘Up yours!’, to continued cooperation with our closest, not to mention most valuable, neighbors. It goes without saying, I hope, that I think this would be a tragically shortsighted decision for the United Kingdom to take and almost certainly result in the breakup of the union (not in and of itself a bad thing, of course). For a country like the UK to have gone through so much, to have changed so much over the last two hundred years only to revert to a little Englander, island-fortress mentality in the twenty-first century is pitiable, or would be if it didn’t also seem so bloody mean. We ain’t got the Empire no more, and nor do we have the means to support ourselves in a globalized world economy without a little help from our European friends. By voting for Cameron, and ever worse: for Farage’s venomous UKIP, we’re turning our backs not just on Europe, not just on the thousands of refugees and immigrants that look to the UK’s shores for safety and at least a chance of a peaceful, prosperous life, but on our own poor, sick and vulnerable against whom right-wing politicians continue to wield the heaviest weight of their harsh, austerity inducing economic weaponry. To be fair, Cameron is probably crapping himself at the thought of a UK exit from the EU (or Brexit, as it’s now being called, because if we’re going to leave the European Union we may as well give the process a horrible-sounding abbreviation, eh? ), which would undoubtedly come at a harsh price for British industry, at least at first. But that hasn’t stopped him trying to pull the UK out of the European Convention on Human Rights (because, you know, who needs those?) or suggesting it’s Britain’s right to “cherry pick” the bits of European legislation that work for it and pretty much just piss on the rest. The problem is that after decades of turning the other cheek, the Europeans are finally getting a little fed up at London’s continual pouting and demands for special treatment that seem to fly in the face of everything modern Europe stands for. In fact, the general consensus appears to be that Cameron’s ‘I’ll take a little bit here, and a little bit there…’ approach to UK EU membership is untenable and that if the British people want out so bad, perhaps they should just go. 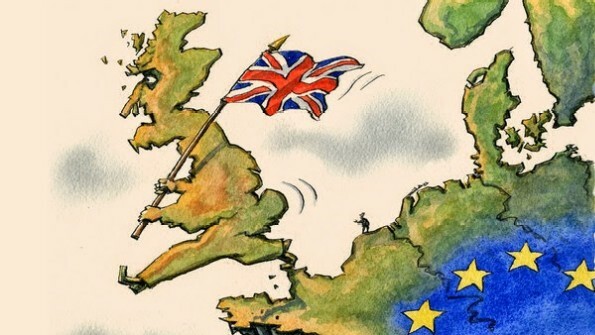 Britain running away from the EU… but to where? The Atlantic is a cold place to go swimming alone and, despite the warmth exhibited by most Americans toward British culture, I doubt Washington would have any interest in making the “special relationship” an economic one. A solo UK may find itself an increasingly small fish in an increasingly big pond. So if the UK public don’t like the EU, how do their European cousins feel about them? Just what is the status of the British abroad? Well, if this recent article from the Guardian highlighting What German comedians think of Brits – from bad to wurst is anything to go by, it ain’t very good. From poking fun at royal baby fever to, bizarrely, suggesting Britain is an island of bowler hat wearing apes, the German equivalent to the Daily Show concludes that we can leave if we want to, “we were never friends”. If you don’t fancy clicking through to the Guardian, you can watch the video below (it has subtitles). The host’s conflation of England and Britain is highly annoying (for me anyway) but apart from that (and a few German-specific comedy quirks), I think it’s kind of spot on. I love being a Brit abroad, and so far I have met nothing but kindness, but it’s time we woke up to the fact that that kindness isn’t guaranteed. We need to start being nicer to our neighbors if we want them to continue being nice to us, and maybe I’m taking liberties here, but despite the recent election, I think we do. The UK is an island nation (or a nation split across two islands at any rate), and we can rightfully be proud of our self-reliant, pull yourself up by your bootstraps past, but we’ve never been an island unto ourselves; whether we like to admit it or not, we need the continent and should be weary of drifting too far from land.